Butterfly wings for kids are a colorful addition to dress-up play or can pull double duty as an easy Halloween costume. Realistic details give these lightweight wings a lifelike feel and elastic shoulder and finger loops provide a comfy fit. 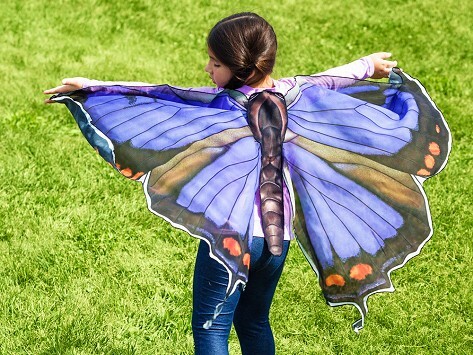 Dimensions: 46" x 24" x 0.1"
Dress-up wings for kids make playtime instantly more fun and these wings really grabbed our attention. Each pair captures the realistic details of a bird's or butterfly’s wings. The bright, colorful wings are a nature-inspired addition to a dress-up clothes collection or can easily pull double duty as a costume. They are lightweight and flowy—all the better for soaring and flapping around—and stay in place with elastic loops at the shoulders and hands. There are two butterfly species to pick from and three birds chosen for being the smartest in the menagerie—the blue jay, macaw, and magpie.